One of the best, bring on the rest. The sentiment expressed in this headline was heard from many of those who attended the 2017 Float and Field fly-in held at Lake Forsyth, near Christchurch. The lake was a millpond on Sunday and many pilots were down to t-shirts and shorts in the late August sunshine. Friday was also a cracker day during which a good deal of flying took place. The light winds during the weekend attracted 65 registered pilots who took advantage of the four flight lines, and a large crowd of on-lookers had plenty to see. The food tent was doing a roaring trade and there was always something to see in the skies above. 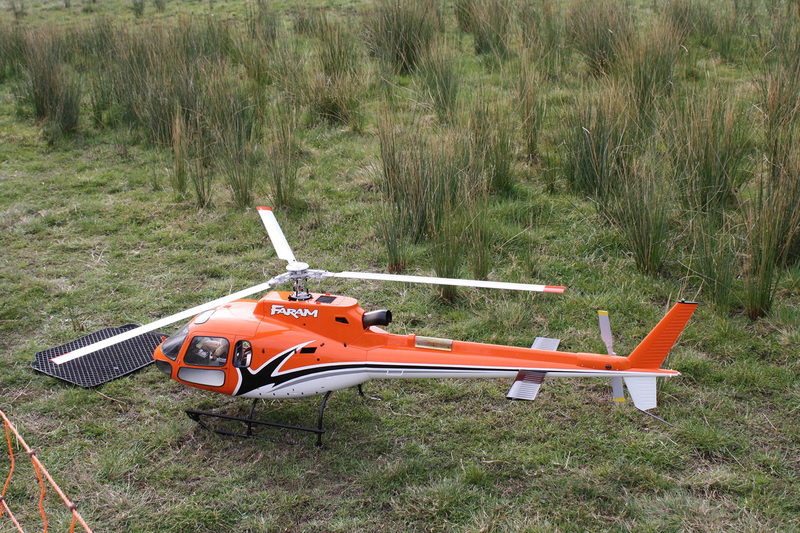 Although, not officially part of the fly-in programme, a rotocross event was organised on Friday and racing quads sped round the gate and tussock circuit through a course organised by Sean McCurrie and Alex Hewson. A good contingent of younger fliers thoroughly enjoyed the racing and the 3-D area. Other models took to the sky from the lake and the main runway and some test flights were completed before the main event opens on Saturday. 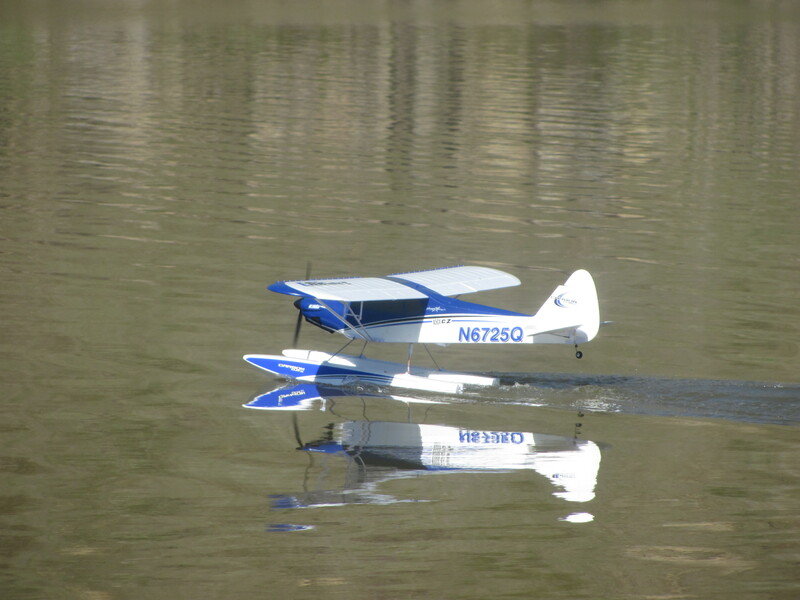 Now in its 21st year, the Lake Forsyth fly-in is one of the largest of its type in the country and there is every opportunity of seeing a wide variety of models and sizes flying. 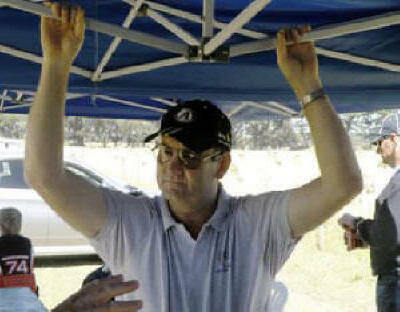 A buy-sell-and exchange tent was again in operation and some trading took place the old fashioned way without the need for electronic intervention. 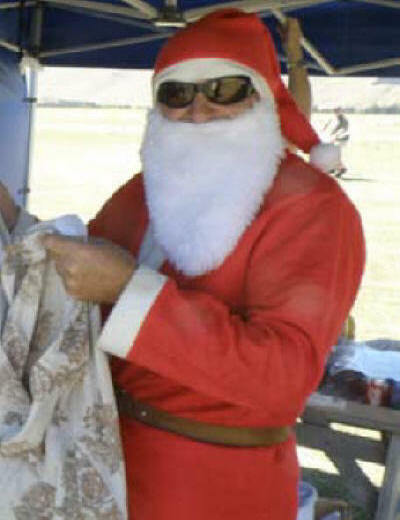 Some pilots had travelled from Invercargill and points in the North Island to enjoy the flying and the comraderie and the local club, Christchurch Radio Fliers, had once again prepared a good strip, flight lines, fences, tents, toilets etc. to make for a safe and spacious site which accommodates the main land strip and lake flight line as well as a 3-D area and a helicopter area. 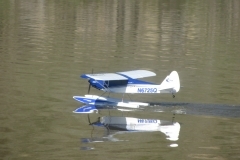 Some interesting models on display included a 2m Seabee seaplane built by Roger Atkinson. 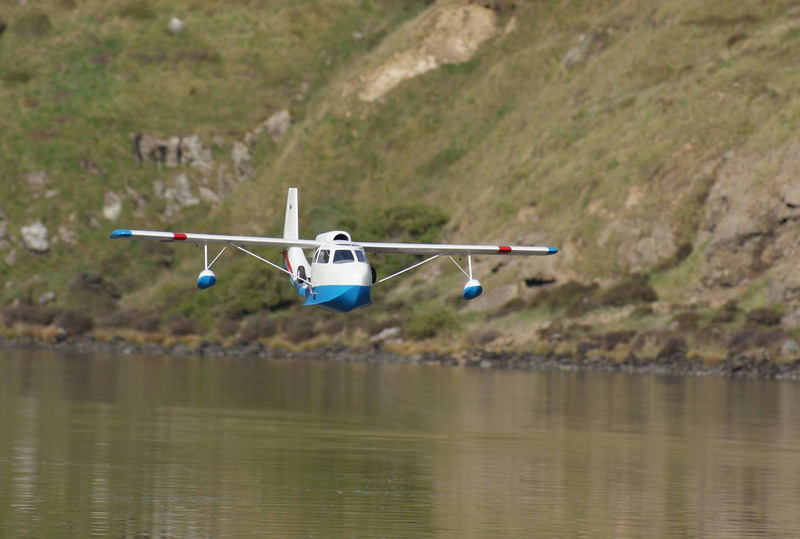 Based on the RC-3 seaplane produced by Republic in 1946, the model was built from scratch and featured a fully amphibious operating undercarriage. Roger said that electric power is the way to go as many modellers who attempt this type with internal combustion engines have trouble balancing the airframe. The CT-114 Tutor jet trainer flown by Jared Mulholland was a popular sight and drew crowd applause every time it was flown, as did the large 3m CARF Sukhoi 31 flown by Alex Hewson. The model is a recent acquisition, but Alex flew some amazing aerobatic routines with great skill. Powered by a DA 170 engine and tuned pipes, the model was remarkably agile. Sean McCurrie had his large Hellcat flying beautifully with a 3 cylinder Saito purring at the front. This is a very atmospheric model, especially doing low passes along the strip. 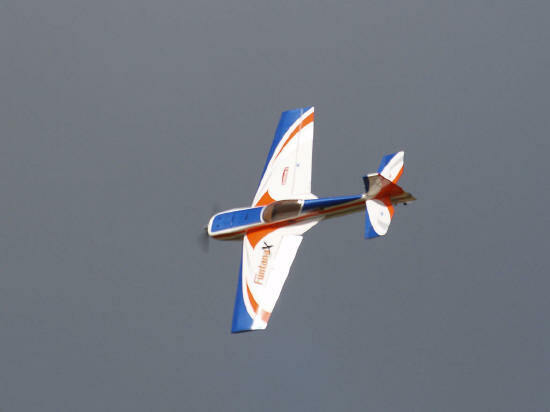 This model won Pilots’ Choice for best land plane. Much smaller, but equally impressive was the Devon of Mike Kingsbury which flew superbly in the light airs. 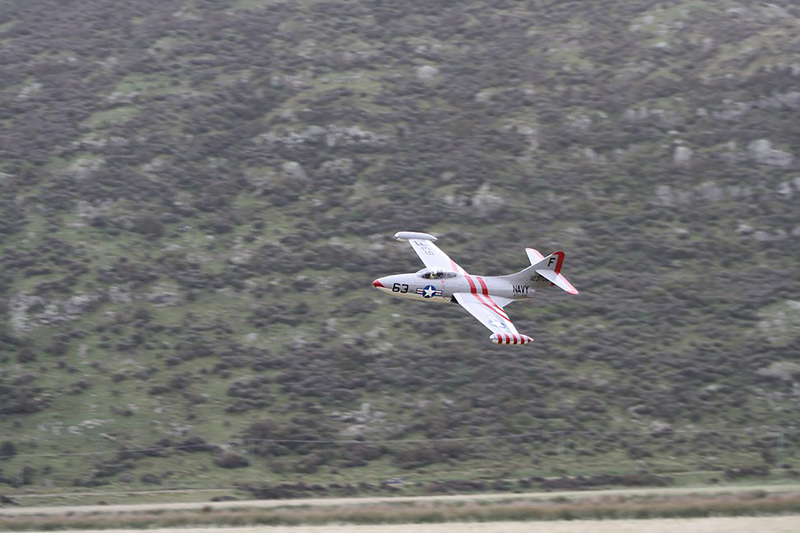 Mike’s Mosquito also made a debut appearance and flew very well, although an undercarriage problem on landing kept the model on the ground for the rest of the fly-in. Proving that you don’t have to be big to be beautiful, John McKenzie’s Howard Pete is a lovely model which looks great in the air, even if it is a little difficult to handle on the ground. John’s model is based on the rare 1930 DGA-3 Howard racer and it won the trophy for the best overall model awarded by patron of CRFC and ex. 747 pilot, Des Lines. On the lake there was plenty of activity, including a bevy of 10-12 Tundra float planes. These 1300mm wingspan foamies from Durafly are very popular and flew extremely well in the conditions. They were certainly put through their paces. 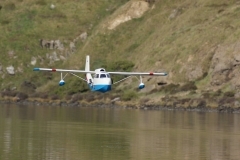 A mixture of float and seaplane models kept up the tempo during both days and the rescue boat was often in action. Prizes and raffle draws were held on Sunday with thanks to sponsors, Hangar One. Forsyth Flyin, August 25th-26th 2018.